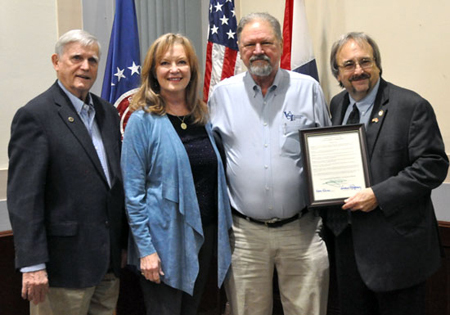 The Clay County Commission March 25 recognized Vocational Services and Developmental Disabilities Awareness Month. Those present were (from left) Western Commissioner Gene Owen, Eastern Commissioner Luann Ridgeway, VSI Executive Director Randy Hylton, and Presiding Commissioner Jerry Nolte. Clay County recognized March as Developmental Disabilities Awareness Month during a ceremony March 25. The County Commission presented the proclamation to Vocational Services, Inc. Executive Director Randy Hylton and recognized the service provided by the organization and their employees. The Commission approved a resolution recognizing VSI as a non-profit organization that has served the community residents with developmental disabilities for over 50 years. VSI operates three unique workshop locations, offers a competitive integration program that places workers throughout the Northland, helps Northland high-school students find meaningful work opportunities, provides casework management for Northland families, and provides work and personal services for those who may not qualify for workshop opportunities. Additionally, VSI manufactures and markets first aid kits for pets and horses nation-wide. This program, Show-Me Animal Products, has created new and exciting jobs for residents of Clay and Platte counties with developmental disabilities. More than 250 Northland citizens are employed through VSI. The Clay County Commission expressed their gratitude and support for VSI in their mission to promote independence and wellbeing for individuals with developmental disabilities within the Clay County!